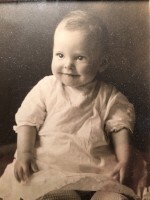 Robert (Bob to everyone) was born in Seattle, Washington, on November 22, 1923 to Minnie Jellison and Claude Vader Hull. He has a surviving brother and sister, Freda Bell Hull Stranack, 97 years old, and William Jellison Hull, 95 years old. A third sibling, Alethea May Hull, passed at age 70. Bob grew up in Ballard, a neighborhood of Seattle. He attended schools in Ballard, but due to his dyslexia, school just wasn’t going to be Bob’s thing. So, at a relatively young age, he worked and traveled learning from experiences. Some of his adventures were not so great; many were beyond belief. These experiences were the source of many of Bob’s endless stories, stories unbelievable to most anyone of this day, and not publishable in an obituary. If you knew Bob you knew his stories. 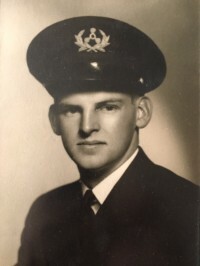 He eventually entered the Merchant Marine and began the early days of his career working in the engine room of ships. 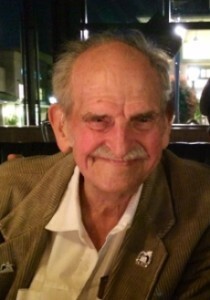 He spent time on cargo ships at the end of World War II in Southeast Asia. 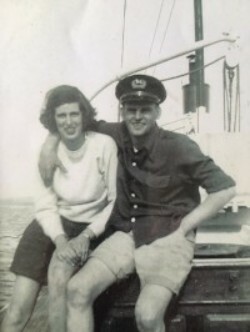 Bob met his wife, Sara Cornelia Longley (Cornie), on a cruise ship bound for Alaska. He was a crewmember working on the ship. 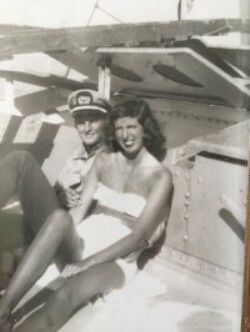 Having been told by the captain to fraternize with the passengers, Bob wasted no time meeting Cornie who spent time sunning in her bathing suit on the upper deck. They were married on September 8, 1950 in San Gabriel, CA. Soon after that, Bob stopped going to sea and purchased a business, Tiny Tankers. 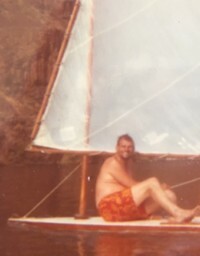 He delivered heating oil to houseboats throughout Seattle’s Lake Union and Portage Bay. During this period, they lived on a houseboat in Portage Bay and two sons were born, Charles Longley (Charlie) on August 6, 1957 and Millard Thomas (Tom) on January 9, 1959. 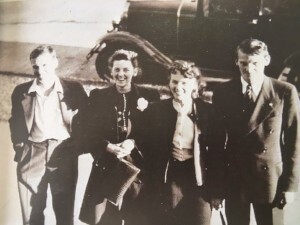 With two small children, Cornie decided that they needed more space and the family moved to a home in Laurelhurst where they lived for 58 years. As houseboats were converting to electric heat, Bob and Cornie decided to sell Tiny Tankers and Bob returned to working on ships as a marine engineer. Bob loved the work at sea, running the largest machines of that time. 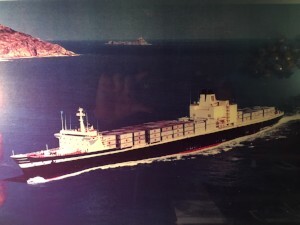 He worked his way up from a Third Engineer of smaller steam vessels to running the engine room as Chief Engineer of the fastest, most powerful, and largest container ships in the world, the SL-7 class. These ships, like the SeaLand Trade, were over 1,000 feet long, carried over 1,000 shipping containers, and cruised at 33 knots. Bob loved working in the engine room and took great pride in his abilities and his crew to maintain the large ships’ engines. Throughout his career, even when in the managerial role as Chief Engineer, Bob couldn’t keep his hands out of the day-to-day work. For this, he developed the nickname “Dirty Bob” because his work clothes were always stained with oil from being involved in jobs that he should have been directing. This was Bob – always a hands-on worker. Bob’s career allowed him a great deal of time off and as such created opportunities for him to take his family on various adventures. Gold panning in Northern British Columbia, camping at Deep Lake in Eastern Washington for a month every year, and one summer driving around the United States including the black lab, Surf, were just a few. One hot summer, Bob suggested to his young boys that they dig a pool in the back yard--and they did--a hole that grew to over six feet deep, was lined with a large piece of polyethylene, and had a cable zip line from a tree fort across the pool. Needless to say, the Hull’s yard was the most popular for the neighborhood kids. With Bob’s imagination and Cornie’s game enthusiasm, little was off limits. 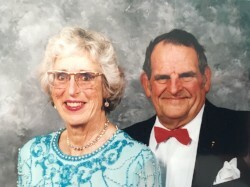 Bob was married to Cornie for 62 years until her death on July 1, 2014. Theirs was a love story, full of adventure, challenges, and as they aged, a very special devotion to each other. After retiring, Bob and Cornie purchased a vacation home on Hood Canal and enjoyed oysters and crabs that Bob pursued with a passion. They eventually sold their Hood Canal vacation home and spent the rest of their lives in their Laurelhurst home. They were regulars at the University Village Starbucks and other neighborhood restaurants, always out and about until the very end. 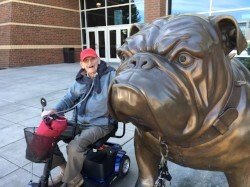 After Cornie passed away two years ago, Bob continued to tend his tomatoes, visit friends, neighbors, and family, while living everyday to the fullest. He was quite a sight driving his Mercedes or on his electric scooter riding from his home to the Village for dinner or around the neighborhood. He enjoyed himself right up until the end – just how he wanted it to be. Besides being a loving husband to Cornie, he was a unique father to Charlie and Tom, father-in-law to Shaela, who at first meeting asked her, “Are you the broad Tom’s been dating?” Bob was a proud grandfather of Daniel, Olivia, and Malcolm. The grandkids grew up on "Bob stories", having their ears covered by their parents as young children, wryly smiling at the ever more inappropriate stories Bob told as he aged. He was a “one of a kind” character, spouse, father, father-in-law, grandfather, brother, uncle, cousin, and friend to so very many. Bob will be dearly missed by all. The Memorial service will be held at 1:30 pm Monday, November 7th, at University Presbyterian Church, 4540 15th Ave NE, Seattle. Bob will be interned at Mount Pleasant Cemetery, Seattle. Please send any remembrances to Shriners Hospitals for Children.